Once upon a time, outside of heating, cooling, and water heating, the refrigerator was the biggest energy consumer in the home. That’s changing. In part, this is because ratcheting standards and programs like ENERGY STAR have led to more and more efficient appliances. However, it’s changing in part because we’re introducing more and more electrical loads into the home. If doesn’t have to been that way. At little or NO cost, we could have much more efficient boxes, reducing power consumption of these and other phantom loads by 50% easily, or much more. But we don’t ask, the cable companies assume (rightly?) that we don’t care. We should. Not only does this mean, depending on electric rates, we could be paying $50 or even $100 per year to keep these running, but collectively we raise the generation demands and stress out our overtaxed electric grid. 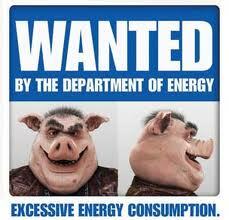 Guess who’s rates will go up as we have to add on new, more expensive power plants? Yep, ours. Guess who pays for the upgrades we’ll need to improve the grid? Yep, we will, in the form of still higher rates. I’m not suggesting we blow up our TV’s (although I do like that John Prine song, Spanish Pipedream). But unless we all expect to win the lottery—rather unlikely, don’t you think?—we need to get much more serious about energy-efficiency, including in our homes. Not just set-top boxes, but insulation, air-sealing, heating, cooling, other phantom loads, the works. Reduce your energy use, save money even if rates go up, help keep rates down, and save even more. It’s an economic no-brainer. In roughly 24 hours, Earth Hour 2010 will begin, and people across the globe will shut off their lights for one hour in order to make a statement. However you feel about global warming, everyone can agree that conserving resources, and turning off lights when we don’t need them, is good for our society and our world. Tomorrow night, the centers and capitals of over 4,000 towns and cities will go dark in order to remind us of the importance of conservation in our daily lives. From Lima to Las Vegas, from the Empire State Building to the Eiffel Tower, cities large and small across the globe will be declaring their dedication to protecting the environment we inhabit. I support Earth Hour 2010 because reducing energy waste is a great idea—and Earth Hour helps call attention to it. It’s easy in the modern world to forget about where energy comes from when you can illuminate your house with the flick of a finger, but each minute that a light bulb is burning unnecessarily is a minute that fuel is being wasted. And in the U.S. more than 50% of our electricity comes from dirty coal. By cutting down on our energy waste, we will reduce our dependence on foreign oil, improve our air quality, and decrease the load that energy companies are facing on a daily basis, all while helping homeowners save money on their energy bills. Who isn’t in favor of that? If you want to join us in supporting Earth Hour 2010, turn off your lights today, Saturday, March 27th, at 8:30 PM EDT. Remember, though, the value here is educational and inspiration. To really get lasting energy savings, and have a long-term impact, you need to make bigger changes with bigger impacts in your home, the type of energy-efficiency improvements we discuss here at the time. Keeping up with the Joneses—How does your energy use compare? There is an interesting article in today’s NY times Utilities Turn Their Customers Green, With Envy about comparing energy use between neighboring homes. This might be a way to motivate people, especially now that having the biggest SUV on the block may not have the appeal that it once did. Our customers are definitely interested to know how their utility bills and some of our diagnostic tests compare to similar homes in the neighborhood. We never disclose what an individual home’s usage or results are without the owner’s permission! But we can talk in generalities about what we see in the area. 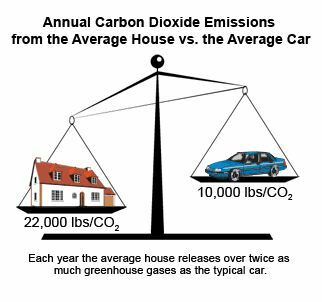 We’ve hosted on our website EPA’s Home Energy Yardstick a simple tool that can give you a rough idea of how your home measures up. Check it out and see how your home stacks up. And contact us if you’d like a more comprehensive assessment and a prescription tailored to you and your home.